Home game double header on Saturday 27 April. Buy tickets online at 2-for-£10! 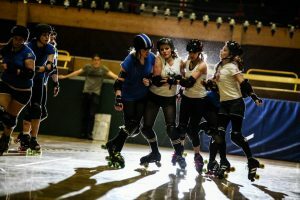 A cold, windy late September afternoon was the backdrop for a double-header of roller derby action in Newcastle that was significant for two reasons. For not only was this the meeting of local rivals Newcastle Roller Girls and Middlesbrough Milk Rollers, but this was also the last bout to take place at Newcastle’s home ground of the Walker Activity Dome for the foreseeable months, with the venue due to undertake a series of refurbishments. The Newcastle teams would be looking to sign off their spell in Walker with another couple of exciting displays of derby action. Excitement is definitely what was on the menu in the first of the bouts of the day, which saw the Whippin’ Hinnies of NRG take on the ‘B’ Team of MMR. In the first five jams, the visitors looked to assert their dominance with some steady point building from jammers Kim Cognito, Swede Dreams, Harry Sonic Jr. and Lexi Palm’eroff, who built up a solid 1-8 lead. But in the following jam, the return of Harry Sonic Jr. very much marked how serious MMR were about spoiling Newcastle’s party. Boozewound Barbie started the jam in the bin, and was swiftly followed by Penny Bizarre and Elizadeath Benhurt, who were involved in a pile up trying to stop the efforts of the MMR jammer. Harry Sonic Jr. proceeded to put on a show of jamming class, weaving impressively beyond on the clutches of Cookey Monstrous and Whippi Longstocking, grabbing herself a 15 point haul for the visitors; 1-23. However, the Hinnies bit back immediately. Jammer Hit One Purl One took an instant lead and, thanks to the work of blockers La Dolce Beater, Boozewound, Dizzy Bizzie and Blackjack Belle, she was able to leave her opposite number Lexi Palm’eroff trapped behind the pack. One successful Purl pass later, and just when it looked as if Lexi would make a breakthrough, Boozewound landed an enormous hit on the jammer, sending Lexi straight to the back once more. Things got worse for the MMR jammer as she was then sent to the bin, causing the deployment of the NRG outside line, allowing Purl to bring home a massive 20 points, pulling the scores back to 21-23. The Newcastle revival just kept going in the following jams. First up was Penny Bizarre, who took advantage of Lexi starting in the bin to gain a further 10 points, giving her team an 8 point lead. The return of Purl as jammer saw another turn of good fortune for the home team. Once more, the Middlesbrough jammer was sent to the bin, this time Swede Dreams, allowing the Purl to glide brilliantly inside the visiting blockers, and bringing in yet another 15 points. Penny Bizarre added another 4 points in the following jam, but arguably more impressive was the fact that the Newcastle blockers had prevented their opponents from registering a single point in this period, with Elizadeath Benhurt throwing in some hefty hits to shut out the enemy jammers; 50-23. The twelfth jam was another action-packed one as it saw Ellie Mental make her first big impact as a jammer for the Hinnies. Although she was sent off trying to force her way through a very tight pack, the Hinnies jammer was helped by Blackjack smashing opposite jammer Kim Cognito off the track, and then being slowed vastly by La Dolce Beater and Whippi Longstocking, eventually being sent to the bin and releasing Ellie Mental. She made one quick successful pass and completed a very good second when a fantastic piece of blocking from Blackjack saw her spring from the NRG outside line to smash a hole in the Middlesbrough defences for her jammer; 61-26. Another mammoth effort followed in the next, thirteenth jam as the Hinnies looked to set themselves up for comfortable lead at the approaching break. Penny Bizarre battled her way through the pack for lead, and put up a major battle with Hulk Grogan to make a great lap of the track. With MMR jammer Kim Cognito being sent to the bin, Elizadeath Benhurt sped into the heart of the Middlresbrough blockers, causing confusion and allowing Penny Bizarre to ease her way through untroubled, totting up a great 20 points; 81-26. The home team succeeded in closing the half on a strong note as the final two jams brought in another 8 points with no reply. First up was Penny Bizarre, who took a quick and sneaky inside route through the pack, followed by Ellie Mental, who battled through the blocking of Hulk Grogan to wrap up the first half of the bout on a great note for the home team. The second half got off to a slow start for both teams, with the resolute blocking from each side preventing any major point scoring. The efforts of Swede Dreams, Harry Sonic Jr. and Iron Duchess meant the visiting total was pulled up to 35, but this seemed to snap the hosts back into action by the fifth jam. An intense battle between jammers Blackjack and Harry Sonic Jr saw the latter just edge lead, only to be halted in her tracks by Boozewound and Torvile ‘n Scream, before eventually being slammed to the floor by Elizadeath Benhurt. This allowed the NRG blockers to wall out Harry Sonic Jr., as Blackjack Belle brought in an impressive 19 points for the hosts; 110-35. Both teams sured up their defensive efforts over the following five jams, as the teams were at loggerheads with how they wanted the bout to end. The Hinnies utilised Blackjack, Hit One Purl One and Ellie Mental as combative jammers who each successfully snatched lead status and simply refused to let their opposition past them, shutting down the scoring of the visitors. Although Swede Dreams was able to gain 4 points for her team, Middlesbrough was denied any further score for the following 4 jams; 121-39. A brief spar between Penny Bizarre and Kim Cognito saw both teams bump their scores by 4, when a great tactical swap was offered by the Hinnies in the thirteenth jam. Jammer Ellie Mental hung back, allowing Swede Dreams to attempt to ease through the Middlesbrough blockers, who had walled up at the rear of the pack. However, the NRG jammer stuck close to her opponent, not allowing the MMR blockers the chance to shut her out, instead leading to Swede Dreams being entangled in the Hinnies wall instead, as Ellie Mental stole the lead, as well as an extra 5 points for the home team; 130-43. Blackjack would add a further 3 points to the Newcastle lead in the following jam, but a collision between La Dolce Beater and her jammer meant that Kim Cognito managed to grab lead status. Fortunately, the Hinnies blockers recovered well, shutting the MMR jammer out with 3 points of her own; 133-46. The final jam of the bout saw the Hinnies get a little bit extra combative as La Dolce Beater, Torvile ‘n Scream and Ellie Mental all being sent to the bin in their efforts to stop any final point scoring for the visitors. Unfortunately for Middlesbrough, jammer Lexi Palm’eroff was sent off immediately after the NRG jammer, meaning that the visitors had to concentrate the majorities of the final jam slowing down the determined Ellie Mental. Although Lexi did make it back on track and indeed score 4 final points, it was too late to make a last big push as the final whistles blew. Best Jammer: Ellie Mental Best Jammer: Harry Sonic Jr.